Yay for Handbrake, the most wonderful open source video transcoder ended its beta phase with version 1.0.0, bringing lots of updates, including new presets, extended video encoding support (VP9 video encoding), bug fix etc. But its interface remains complicated for casual users and not everyone knows how to convert video with Handbrake 1.0.0 or the latest 1.07 correctly. We look at some of the most important updates to video transcoding and complete HandBrake tutorial on how to make Handbrake finish the video encoding process properly, from the very first step of downloading and installing the tool to changing various video audio settings. MacX Video Converter Pro - Decode and encode video smoothly in at least 5x faster speed than HandBrake, with video/audio quality untouched. It supports 370+ video audio codecs with 350+ preset profiles for iPhone iPad Android TV etc. The most obvious improvement in Handbrake 1.0.0 is the new presets, adding a slew of options, from General 1080p30 to devices-specific TV, Roku, which changes the performances on video and audio conversion procedure. 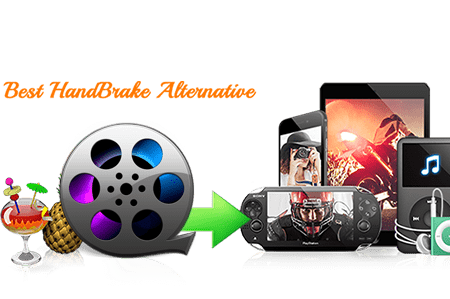 Users can directly use HandBrake to convert video to HQ 1080p with slower speed, or encode video to 480p with faster speed, and transfer video to Xbox, Roku, PS, Fire TV, Chromecast etc. compatible formats. HandBrake 1.0.0 starts to support VP9 video encoding via libvpx and Opus audio encoding/decoding via libopus. Other good news include enhanced x265/x264 encoder performance in HandBrake 1.0.0, support for Interl QSV H.265/HEVC encoder, new Auto anamorphic mode and new Decomb/Deinterlace filter settings. Open HandBrake official download sites, https://handbrake.fr/downloads.php, and download HandBrake 1.0.0 (the current version 1.0.7) for Mac OS (OS X 10.7-10.13), or Windows (Vista-10), or Unbuntu. Note that Handbrake windows version "requires that the Microsoft.NET Framework 4.6 Client Profile is installed." If you encountered problems at the first step, read "HandBrake download and install" guide. Click "Open Source" on the top-left corner and select "File" to open a single video file or "Folder" to open a folder with multiple files. HandBrake 1.0.0 allows users to load video file by simple drag-n-drop. Check Handbrake supported formats here before you learn how to convert video using HandBrake 1.0.0/1.0.1. To convert multiple videos on HandBrake 1.0.0, go to Tools > Preference, turn on automatic file naming and set a default path. Then select "Folder" and Handbrake 1.0.0 will scan and display them as titles, go to Add to Queue > Add All. You can click Show Queue and get titles info and delete video titles you don't want to convert. There're a ton of presets on HandBrake available, enabling you to convert any videos, regardless of the formats MP4, AVI, MKV, FLV, WMV, rsolutions UHD, 1080, 720p, 1080p30, 720p30, 480p30 at fast speed. It can directly transcode video to Roku, PS, Fire TV, Apple devices, Windows Mobile accepted formats. One noticeable preset, VP9 MKV encoding, extends HandBrake reach to video to VP9 MKV conversion. Click "Browse" on the Destination part, and select a folder to store the output profile. Click Container and select one as output from the submenu. HandBrake 1.0.0/1.0.1 can convert video to MP4 or MKV format. For other outputs, please turn to HandBrake alternatives, or older version of HandBrake to convert MP4 to AVI. 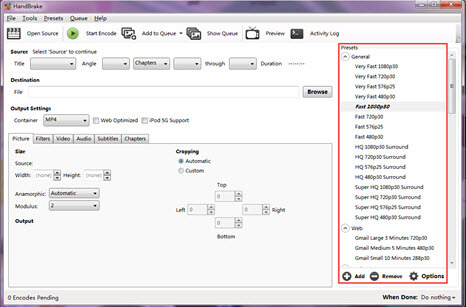 HandBrake 1.0.0 gives more control on parameters adjusting. But if you are not sure how to do this correctly, just ignore it. Many users reported scrambled/messy video output, and for some, improper settings are to blame. Dig out more solutions to HandBrake 1.0.0 errors here. You can adjust picture width and height and crop image. The "Preview" section on the top lets you preview the video you are editing. VLC is required to be installed on your computer to preview video. The video and audio section allows you to decode and encode video using HandBrake 1.0.0 with H.264(x264) codec, MPEG-4, MPEG-2, H.265(x265) codec, any one of them, for playback on devices, media server, or uploading to YouTube etc. You are free to change video frame rate, like converting 60fps to 30fps using HandBrake 1.0.0, adjust audio bit rate, audio channels, import SRT subtitles, and many more. Note that you'd better not convert video in batch using HandBrake 1.0.0 if you need specific subtitle or audio tracks that automatic selection feature doesn't support. Tracks are reset with every new source/title selected, warned by HandBrake 1.0.0/1.0.1. We also come up with some tricks for you on how to tackle "Handbrake 1.0.0 no valid source found" since many including me are bothered by this problem. Click "Start Encode" to begin the video conversion process with HandBrake 1.0.0. HandBrake 1.0.0/1.0.1 gives options to stop or pause. Output: MP4, H.264 (255MB), 30pfs, AAC audio with 160 bit rate, AC3 5.1 channel. Note: Some other picture and video parameters are set by default. The speed also depends on your personal computer specs. 1. 5x faster speed. QSV and CUDA tech and multiple CPU cores options (up to 8 cores) makes it at least 5x faster than HandBrake 1.0.0. No stuttering, no VP9 video encoding crashes. 2. No quality loss. High Quality Engine is embedded into the HandBrake video converter alternative, making it output the original quality. 3. 370+ video and audio codecs. It supports to input and output nearly any video audio (container) formats, including VP9, VP8, MKV, MP4, AVCHD, MTS, MOV, H.265, H.264 etc. with 350+ preset profiles for Apple Android devices, covering iPhone 7/SE/6s, Galaxy S7, Apple TV 4, iTunes and more. 4. Ease of use. It can convert video by simply loading files, choosing output profiles and clicking run. Super easy even for novice users. 5. Video editing, like trimming, cropping, adding sub, compressing, etc. and video downloads in 720p, 1080p, UHD, VR 360 from 300+ sites. Feel annoying that the video is out of sync audio in Handbrake when you rip DVD and convert video on Pc/Mac with it? Don't worry, this tutorial will give you reasons and tell you how to solve Handbrake audio/video out of sync problem on your Mac and PC to ensure you a consistent and synchronous video and audio playback. 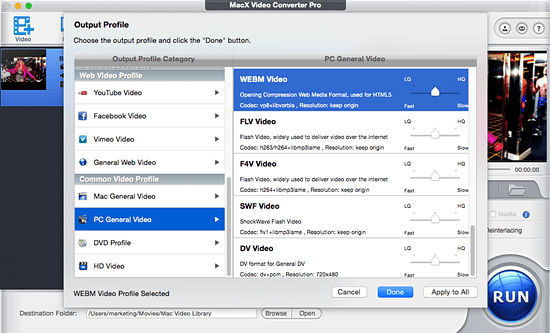 MacX Video Converter Pro is an all-in-one best Handbrake alternative and video editor with top quality and fast speed. This feature-rich video editing software also can help you easily download HD or SD videos from YouTube, Vevo and more 300+ sites.